ROSTOCK, Germany, April 2, 2019 /PRNewswire/ -- A-ROSA Flussschiff GmbH has commissioned a new ship from the Concordia Damen shipyard in the Netherlands, to be delivered in early 2021. The new vessel will be used mainly on the northern Rhine, leaving from Cologne and calling at Amsterdam, Rotterdam, Bruges and Antwerp. A-ROSA has been setting new standards in its industry for many years. "The new A-ROSA ship features a wealth of innovations, making it a world-first in the river cruise industry. It will be perfectly tailored to fit our city-trip concept for the whole family. This means we're paving the way for a new era of cruises, offering guests the perfect combination of discovery and relaxation. 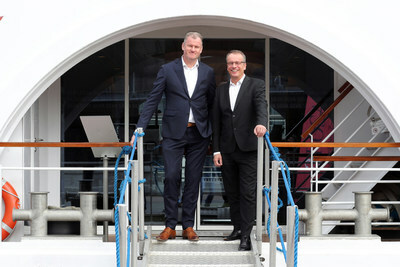 At 135 metres long and 17.7 metres wide – and with a fourth deck – the new ship will provide more space for us to not only meet our guests' expectations, but to exceed them," said Jörg Eichler, managing director of A-ROSA Flussschiff GmbH. "The Concordia Damen shipyard is the best partner for this project – the company is both rich in tradition and innovative, and it stands for quality and reliability," continued Eichler. City breaks by ship are the ideal kind of holiday for young and old, since they can meet all the different needs of children, parents and grandparents. That's why A-ROSA specialises in family cruises. Children aged 15 and under travel free, and during the school holidays there is a ship in each of A-ROSA's regions of operation that provides childcare from 8 a.m. to 9 p.m. in the Kids' Club. "Our new ship will offer even more outstanding facilities for families. We will have a dedicated Family Area housing spacious family cabins (28 m2) and the Kids' Club, where youngsters can run around and play, do craft activities and read," explained Eichler. A further planned highlight is the sun deck, which will feature a large swimming pool and a separate children's pool. The extra room on the new ship won't simply be used for more passengers – A-ROSA has put a great deal of effort into ensuring the best possible utilisation of the space. The 140 cabins set new standards for spaciousness. The double cabins cover an area of 21 square metres, which is unprecedented in the industry. As well as a larger bathroom, they each have a dedicated sleeping area and a living area. In addition, the cabins outside the Family Area each have a large balcony with seating for two people. A-ROSA is passionate about giving its guests wonderful culinary experiences. The new ship will have its own restaurant for serving five-course meals. Guests will also be able to recharge their batteries in the extra-large spa and wellness area, which will feature a sauna, whirlpool, ice room, heated loungers and treatment areas. A-ROSA has also considered the ship's crew, of course: all crew members on board will be accommodated in spacious one- or two-person cabins. There will also be an extra-large mess room with its own kitchen so that the crew can eat together. For the first time, the crew will also have their own dedicated space to relax. Environmental protection is a priority for A-ROSA. "We want to protect the natural areas that we travel through – and the urban areas, of course. That's why we brought Matthias Lutter on board to oversee the new ship project – he's an expert on alternative drives. Together with the shipyard, he developed an E-Motion ship that switches to battery power when approaching a city, so that it doesn't produce any emissions on the approach," said Eichler. Like all the other ships in the fleet, the new vessel will also be equipped with a shore power connection. This allows for battery charging overnight, so the ship will also be able to leave the city without producing any emissions. In addition to A-ROSA's usual energy-saving and environmental protection features, the new ship will also have an optimised hull design and employ "DACS" air-bubble technology – patented by the Damen shipyard – to reduce fuel consumption. By the time the second ship – planned for 2023 – joins the fleet, it is expected that the prototype's innovations will have been further optimised. "Our new ship heralds a new era of travel – both in terms of sustainability and use of space, and in terms of creating the perfect city break for people of all ages that is personalised, stimulating and relaxing at the same time," concluded Jörg Eichler.